Chocolate candy sellers take notice! Are you a chocolate candy maker or have you thought about selling your homemade candy online? Well, now you can! We have just launched the Chocolate Candy Mall Store to make it possible for vendors all over the world to offer their delicious creations to the thousands of people who visit CCM every week. I love buying treats for my friends and family, and I can't wait to try out some of our new vendors. If you give them a try yourself, don't forget to leave feedback so we can help each other find the very best! With the financial instability of the economy making life a bit tougher for most of us, the CCM store is a great way to take something you love and turn it into a little extra income. Of course, I know that there are times when you need to buy from the professionals! For that reason you'll find my favorite commercial chocolate candy sellers that I enjoy dealing with and are recommended throughout the pages of Chocolate Candy Mall. 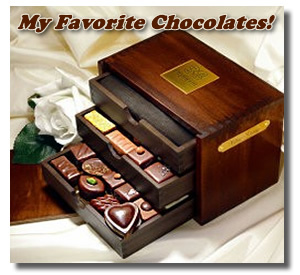 The chocolate candy companies you see listed will change periodically as I develop the site and discover new gems. Sadly, there will be times when I prune a few chocolate candy suppliers for one reason or another. If you have either a positive or negative experience with a chocolate candy maker that I've recommended, do tell. Or maybe I've left out your favorite. I not only want to direct my guests to the suppliers of delicious chocolate candy, but also to those who deal well with their customers. I would love to get your opinion! No, I better not go there. So, your help will be appreciated. You will be saving me from a glorious fate.